The high flood water levels at the San Bernard mouth yesterday show the river didn't quite manage to get over the high beachfront dunes. 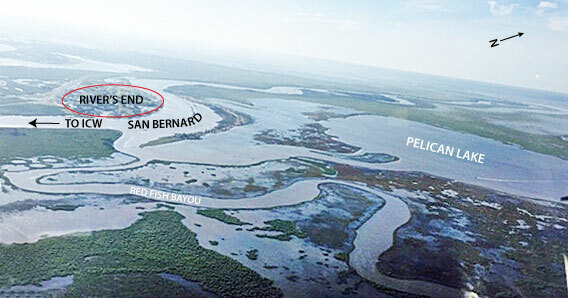 The red dotted lines indicate how close, yet so far, the water came to reaching the Gulf! Freeport can be seen in the distance, top left of the photo. Photo shows the River's End area looking NW with quite a lot of water in the creeks, lakes, and estuaries. 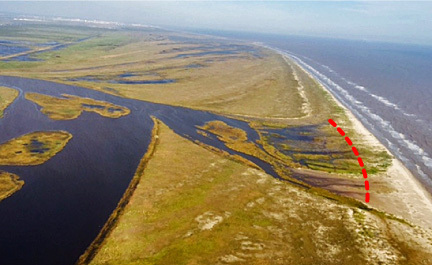 The Intracoastal Waterway lies .67 miles to the south (left in photo) of River's End. This photo shows numerous barges (red circles) stacked up east of the Brazos River waiting their turn to cross through the flood gates. As pilot photographer Bert Smith flew over the West Floodgate, it was open and a barge was west bound thru it heading towards the San Bernard. Brazos River Floodgates repairs are being extended. J&S Contractors will be working at the Brazos River Floodgates for repairs to the East and West Floodgates. This work may require closure of the Locks during the designated periods of work, Monday through Friday. TIME: From the hours of 7:00 a.m. to 5:00 p.m. Monday through Friday. Work will not be performed on weekends or Federal holidays. Note: Since the Floodgates are not closed 24-7, the waters of the flooding San Bernard have been able to flow through the West Floodgate when open and on down the Brazos to the Gulf.